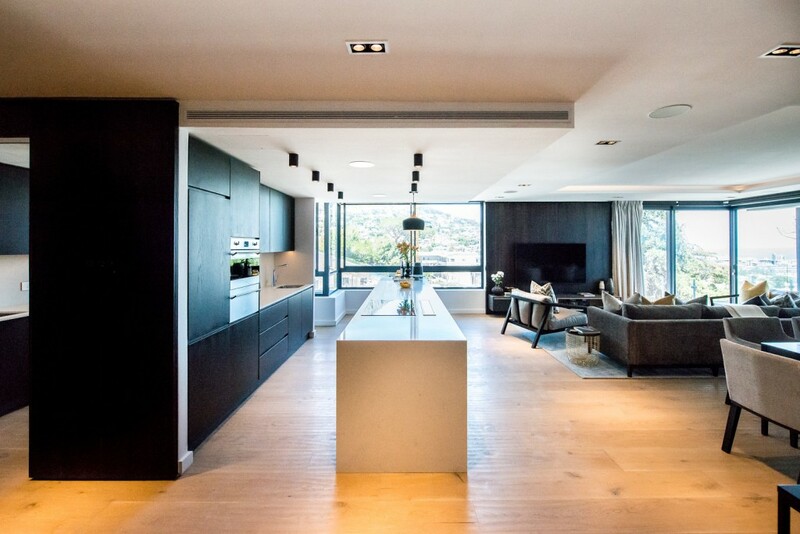 Award-winning design studio Inhouse was commissioned by the Berman Bros Group (BBG) to design the interiors of a series of two- and three-bedroom apartments situated in a new luxury development located on St John’s Road in Sea Point, Cape Town. Rather than creating carbon copies and giving all 16 apartments the same design treatment, Inhouse has created two distinct styles to cater for different tastes. There is also a penthouse, the 17th apartment, which will be given its own unique interior. 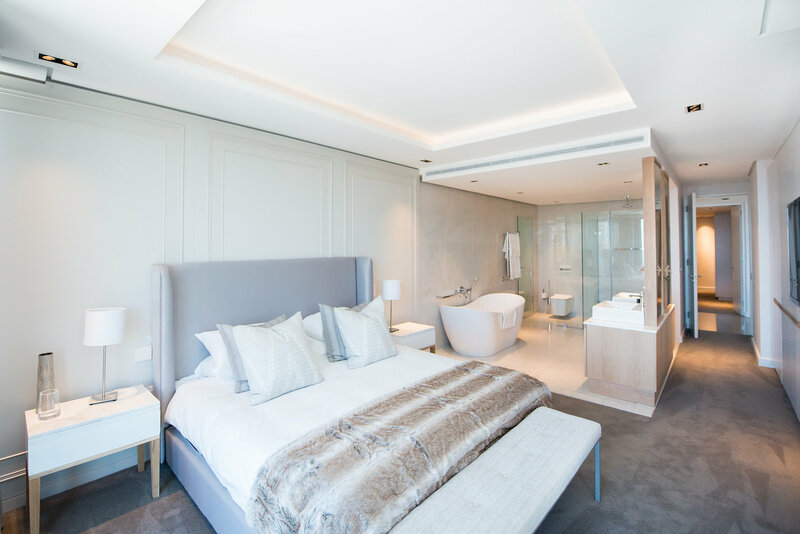 Each of the 16 three- and two-bedroom apartments feature an open-plan living area and bedrooms with en-suite bathrooms, but the contrasting interiors of the units create starkly different atmospheres. 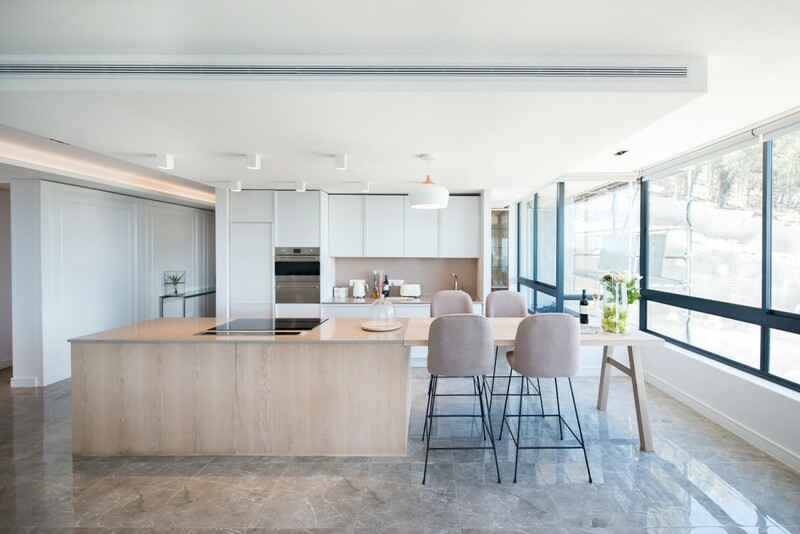 Eight of the apartments have a modern contemporary aesthetic with a predominantly dark palette, while the other eight apartments boast a classic contemporary direction and a neutral colour palette. This gives potential owners the option to choose the interior they prefer while demonstrating the power of interior design to transform a space. 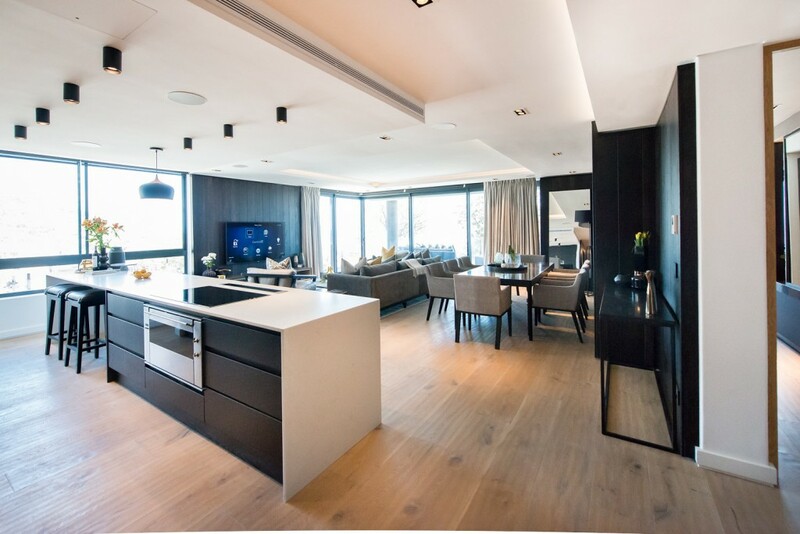 In each of the classic contemporary apartments, marble floors feature throughout the spacious open-plan living area, which comprises living, dining and kitchen zones. A subtle mix of classic and contemporary elements with soft, delicate textures makes the interiors warm and homely. In the kitchen zone, an island clad in natural oak with a polished marble countertop takes centre stage, with white cupboards and classic beaded wall panelling giving the space a light and airy feel. 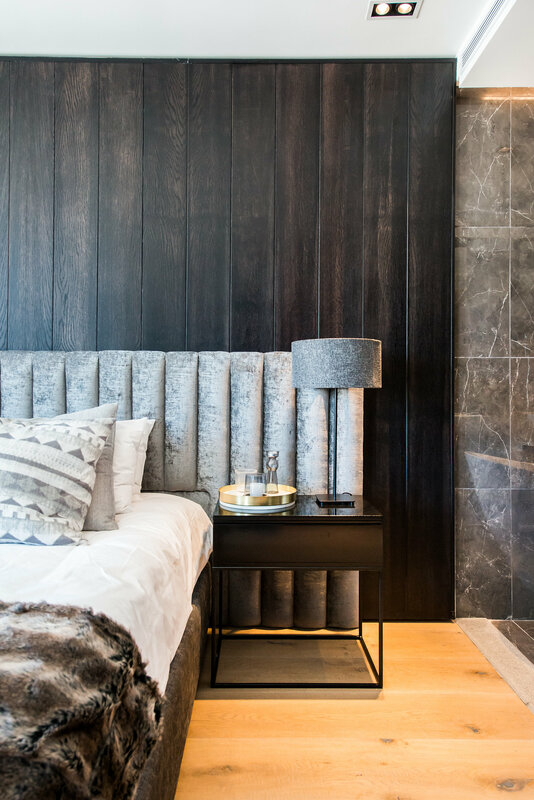 In the bedrooms, the neutral colour scheme continues with soft oak fixtures, plush grey carpets and the same classic beaded wall panelling adding the final touches. For the second series of apartments, the designers opted for modern finishes and moodier tones, such as dark brown, grey and black, with hints of gold. The open-plan living room and kitchen area features wide plank oak flooring, with walls and cupboards panelled in black-stained oak. The kitchen island is clad in timber and finished with a polished marble countertop. In the bedrooms, light oak flooring and timber wall panelling make up the dominant design features. The overall look-and-feel of these apartments is modern, bold and luxurious. Due to the similarity of the layout of the 16 apartments, there are some elements that have been duplicated in both designs, such as the large black-framed windows that allow natural light into the kitchens and living areas, and the modish light fixtures placed above the islands that provide additional lighting. Ceiling troughs lined with soft LED lights, along with skimmed ceilings with double recessed downlights, feature in both designs as well. In the living rooms, picture windows open up onto balconies that provide magnificent views of Cape Town’s Atlantic Seaboard. On the balconies, comfortable seating provides additional space for homeowners to entertain and take in the views of the city. 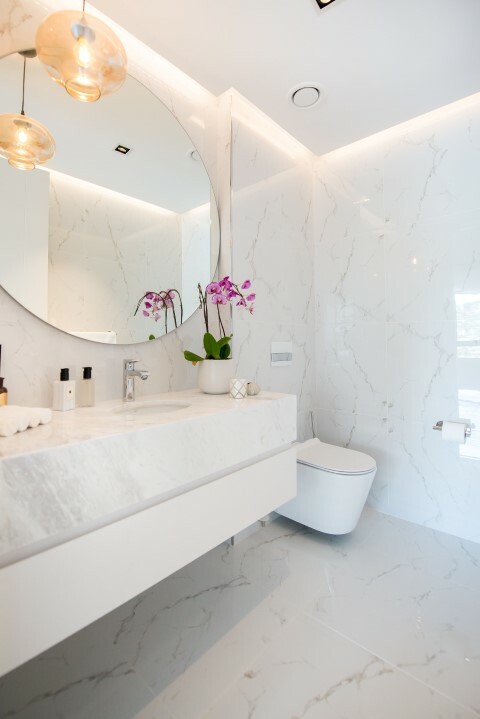 The main bedroom in each apartment features an open-plan en-suite bathroom that has been tiled in wall-to-floor marble tiles and comprises a shower, a freestanding bathtub, and two mirrors that are framed in wood and attached to marble countertops that are fixed to wooden cupboards. 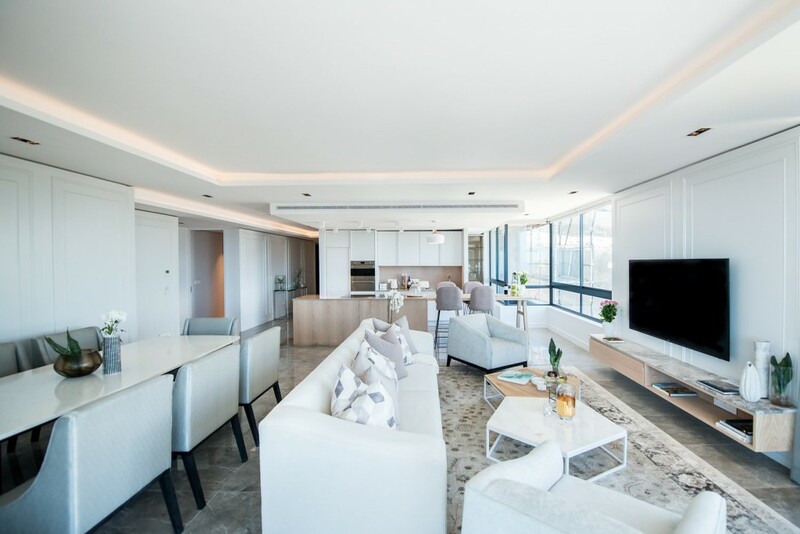 Whether you prefer a contemporary apartment with classic finishes or a modern apartment with loads of character, Inhouse has successfully designed two luxurious and spacious interior variations that will cater to either taste. For information on Inhouse’s other projects, visit www.inhouse.ws. To inquire about the St John’s Road development, visit www.bermanbrothers.co.za.